I recognized three from grocery shopping at my hometown food co-op, the Honest Weight in Albany, NY: Whitney’s Castleton Crackers based in Vermont (which was the source for two of the ten crackers noted, (1) Middlebury Maple (a maple syrup glaze complements stinky Muenster and Roquefort according to Pandolfi) and (2) Rutland Multi-Seed Rye (sturdy and sprinkled with seeds, great with brie, smoked fish, and charcuterie according to the knowledgeable food writer). 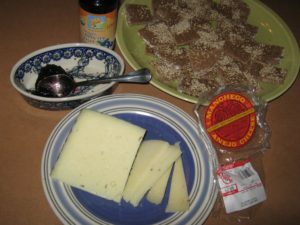 My local food co-op also had on its shelves Effie’s Oatcakes (top these nutty oat cakes with a sharp cheddar cheese advised Pandolfi). The other listed crackers were equally intriguing! The DIY recipe offered by Keith Pandolfi was enticing too: Rye Crackers With Figs and Seeds. Although I’ve purchased Whitney Castleton Crackers as small holiday gifts for friends and family, I didn’t indulge. 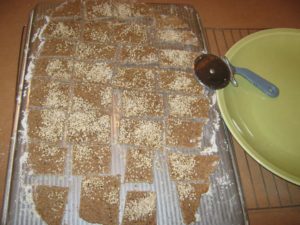 I stuck with store bought Ak-Mok Sesame Crackers, made with organically grown and stoneground whole wheat flour, at a much lower “price-point.” But in the back of mind, there was always an idea to home-bake my own crackers. How hard would that be? My starting point was the ever-handy cookbook, Joy of Cooking by Irma S. Rombauer, Marion Rombauer Becker, and Ethan Becker (New York, NY: Scribner, 1997). The encouragement often given in this reliable cookbook is much appreciated: for example, a recipe for Cranberry Pecan Muffins posted on this website last Thanksgiving noted this advice: “Remember that muffins invite substitutions and inventive flavoring, and that any coffeecake, quick loaf, or corn bread batter can be made into muffins as well” (p. 782). For brushing on the dough before baking: 1/2 cup water with 1 teaspoon sea salt stirred into it. My recipe varied from the recipe clipped from my local newspaper by substituting 3 whole grains, wheat, rye and corn for 1 and 1/2 cups of 100% wheat flour. The whole wheat pastry and rye flours and blue corn meal used in the recipe were all organically and locally grown in upstate New York, from Farmer Ground Flours (farmer owned, farmer grown in Tompkins County). The flours and corn meal, as well as the unhulled sesame seeds, were available in the inspiring Bulk Food department, with its nearly 1000 (yes, one thousand!) bins of bulk foods, of the Honest Weight Food Co-op in my hometown of Albany. 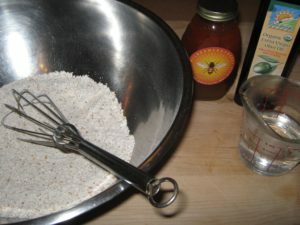 Whisk together the flours, corn meal and salt. 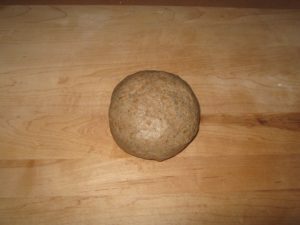 Turn out on a floured board and knead by hand, adding extra flour if the dough seems too sticky, until it comes together and can be shaped into a nice looking ball (about 10 minutes). 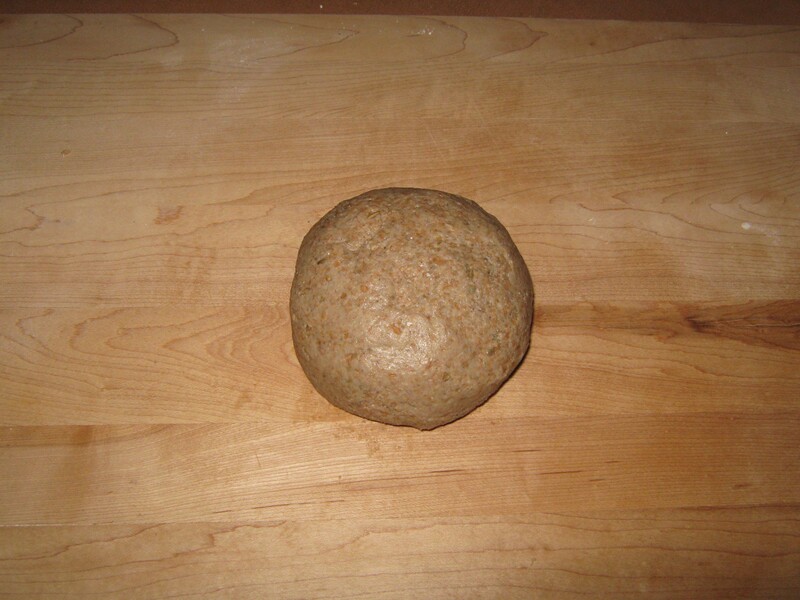 Put the dough ball back into its bowl and lightly coat with olive oil (approximately a teaspoon). I followed the directions of the recipe clipped from my local newspaper and covered the dough ball with plastic wrap. Rest the dough ball for an hour. 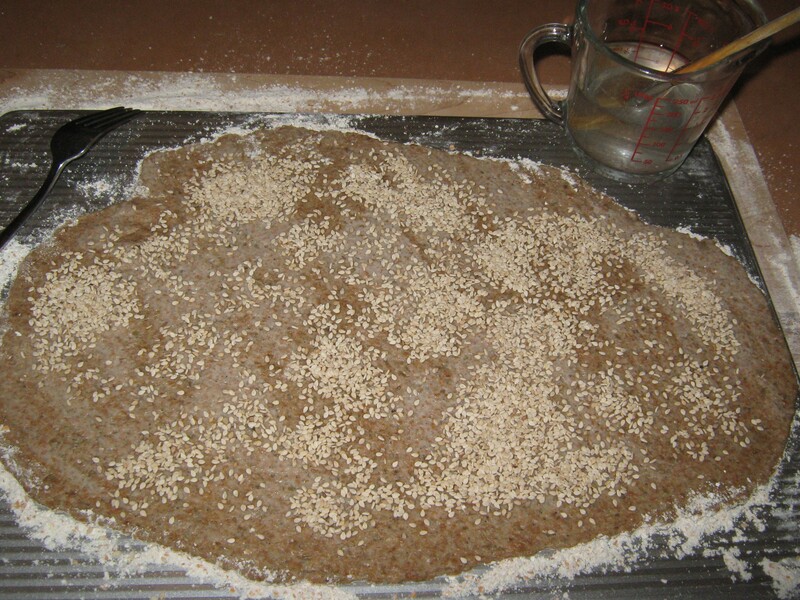 Flip over a heavy rimmed baking sheet, flour it heavily, and roll out the dough onto the back of the sheet until it covers the pan more or less from edge to edge. It should be quite thin. Brush off the pan any extra flour. 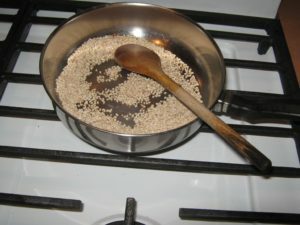 Brush the dough with the salt and water, prick it all over with a fork (so the crackers don’t ballon up in the oven), and sprinkle with the sesame seeds. Don’t worry about making sure the crackers are separated: they’ll break apart easily after baking. Bake the crackers for 10 minutes, until they are golden and browning slightly on the edges and looking very baked. 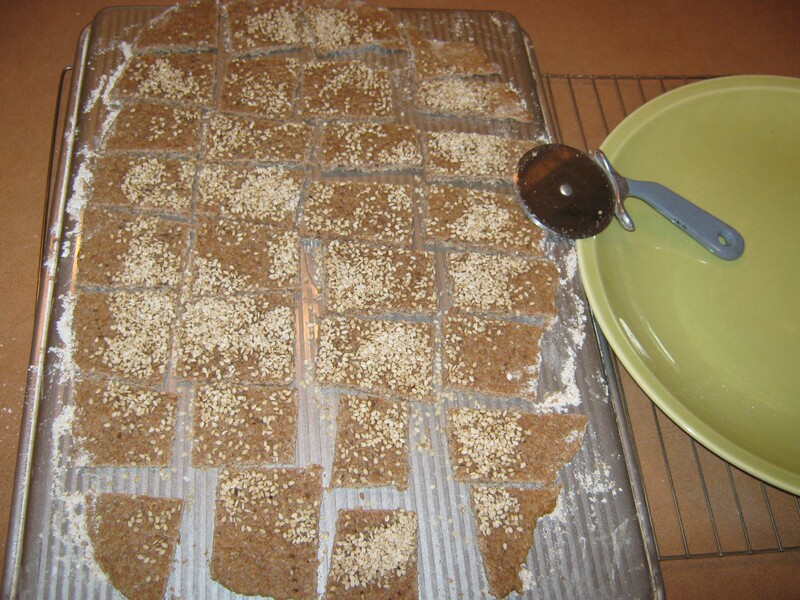 Remove the baked crackers to a cooling rack. Use a pizza cutter (or a large knife) to cut the baked dough into the cracker size of your choice. The recipe clipped from the newspaper noted that the crackers would “crisp up nicely” while cooling. However, the crackers I baked never became crispy and remained chewy (but delicious, still!). My hunch is that using corn meal made for the chewiness. For crisp crackers, corn flour, which is more finely ground than cornmeal, should be used instead. And the higher oven temperature of 450 degrees suggested by the Joy of Cooking cookbook (instead of 425 degrees) might result in crisp crackers. 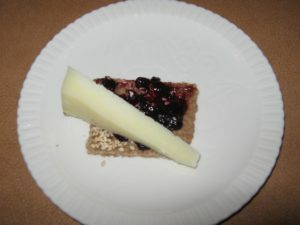 But the tastiness of these homemade crackers cannot be disputed and in less than 24 hours, they all were enjoyed with toppings of Manchego Anejo aged sheep milk cheese and Bionaturae organic bilberry fruit spread: a festive homemade treat perfect for picnickers. One further note: After googling for cracker recipes, I discovered this delicious-sounding cracker recipe for Seedy Oat Crackers from Bon Appetit magazine. Although they require a total baking time of 40 minutes (and the use of parchment and flipping over the dough to bake on the “other” side), this cracker maker will be heating up the kitchen on another cool summer morning. The Bon Appetit recipe, which uses rolled oats and a variety of seeds (and no flours of any sort), is tempting.